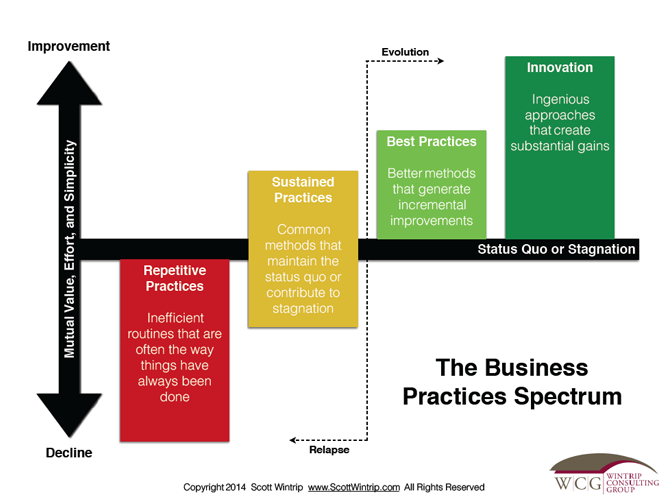 Click on the image below to download your copy of the Business Practices Spectrum (BPS). Working left to right, review your key, specific processes using the questions on the back page of the BPS. When you answer two or more questions in a column “yes,” stop, as you’ve identified the typing of that process. For all aspects of your business rated less than innovative, work on moving those towards being an Innovative Practice. Need help? Contact Scott for a BPS review.